As he spoke Connie noticed that his face was attractive in a wonderfully flawed sort of way; it held a sharp, straight nose peeling with sunburn, and mischievous green eyes bracketed by deep smile lines. His hair was pulled back in a ponytail, a brown color bleached by the sun. Connie smiled at him. Doesn't this sound like a charming book? It was very fascinating. The last time I read about the Salem witches was in Arthur Miller's The Crucible. 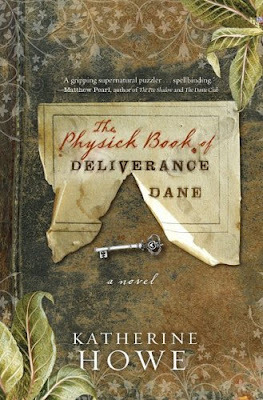 The Physick Book of Deliverance Dane was another way of looking at a terribly captivating time in history. Connie Goodwin, a Harvard graduate, gets her hands on a bible and an ornate key in her grandmother's ancient house in Marblehead, Massachusetts. The key contains a paper with the name Deliverance Dane written on it. This seems like a perfect source for her dissertation to Connie, who decides to search for the long lost recipe book of Deliverance Dane, who appears to have been a Salem witch. Along the way, we're treated to glimpses of the past and of Deliverance's life. I loved the first half of the book. I loved the descriptions of Deliverance's life, and what they told us about the lives of the women of her time. The rich, musty, earthy feel of the past, of history, was evident throughout the book. I also enjoyed Connie's journey to uncovering the truth. I lost much of my interest halfway through the book, though, when the story turned from all its historical goodness to fantasy. I was looking for a book that told me about the witch hunts and the victims of the witch trials and their terrifying but intriguing past. I didn't think it would turn into a "Ooh, magic exits" thing; as it did once the modern-day characters started performing magic themselves! I had hoped against this very predictable twist from the moment I started reading the book, but I was disappointed. The plot wasn't very quick paced; the author concentrated more on noticing and describing in detail the littlest things. That being said, it was a good read. I would recommend this book to anyone who likes historical books, can deal a relatively slower plot and doesn't mind a dash of fantasy! I won't say I loved the book, but I am glad I read it. It definitely sounds charming. I haven't read many books about this time period. I'm adding it to my list. Thanks for putting this on my radar.